Juan Guaido, Venezuelan opposition leader and self-proclaimed interim president, pauses as he speaks during an interview in Caracas, Jan. 31, 2019. Momentum is growing for Venezuela's opposition movement led by lawmaker Juan Guaido, who has called supporters back into the streets for nationwide protests Saturday, escalating pressure on embattled President Nicolas Maduro to step down. A defiant Maduro's socialist government has called on its own loyalists to flood the streets waving flags to celebrate the 20th anniversary of the Bolivarian revolution launched by the late Hugo Chavez. Guaido has turned down offers from the presidents of Mexico and Uruguay to negotiate with Maduro. In a letter, Guaido urged both presidents to back Venezuela's struggle, saying to remain neutral aligns them with Maduro. "At this historical moment that our country is going through, to be neutral is to be on the side of the regime that has condemned hundreds of thousands of human beings to misery, hunger and exile — including death,'' he said. Guaido declared himself interim president last week before tens of thousands of cheering supporters and vowed to end Maduro's "dictatorship.'' His claim to the presidency is backed by the United States and some two dozen other nations. President Donald Trump's national security adviser,John Bolton, tweeted Thursday that Maduro and his top advisers should retire to "a nice beach somewhere far away from Venezuela.'' Bolton's talk turned tougher Friday in an interview with conservative radio talk show host Hugh Hewitt in which he warned that it could be a beach area more like Guantanamo. Later Friday, Bolton tweeted that Washington would send humanitarian aid to Venezuela despite Maduro's refusal to accept such assistance. The comment came after Guaido said he would defy the aid ban and receive convoys of medicine into Venezuela with the help of neighboring nations. "Pursuant to the request of interim President Juan Guaido, and in consultation with his officials, the U.S. will mobilize and transport humanitarian aid — medicine, surgical supplies and nutritional supplements — for the people of Venezuela. It's time for Maduro to get out of the way,'' Bolton's tweet said. Maduro remains dug in, blaming the White House for openly backing what he calls a coup to remove him from power and exploit his country's vast oil wealth. 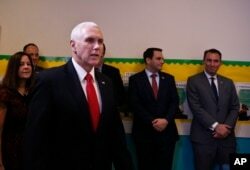 He retains support from powerful allies, including Russia and China, but is growing increasingly isolated as more nations back Guaido. 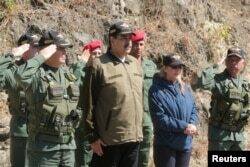 Venezuela's President Nicolas Maduro attends a military exercise in in Caracas, Feb. 1, 2019. The military's top leadership is backing Maduro, though analysts warn that rank-and-file troops frustrated by their country's economic and humanitarian crisis may not share that unwavering loyalty. The opposition's street protests planned for Saturday are the second such mass action this week. Guaido led a peaceful demonstration Wednesday with residents stepping out of their homes and workplaces for two hours. Last week, street protests turned violent in days of unrest that killed nearly three dozen people in clashes with government security forces. Meanwhile, a prominent opposition lawmaker called on a group of European Union and Latin American countries to support Maduro's ouster — without negotiations. An "international contact group'' announced Thursday by the EU's top diplomat, Federica Mogherini, "should help to cease the usurpation of power by Maduro and establish a transitional government until new elections,'' said Francisco Sucre, who heads the international committee of the opposition-led National Assembly. "There is no possible discussion here. Maduro has to leave,'' Sucre told The Associated Press in Madrid, where he wrapped up a three-day European tour to enlist support for Guaido. The European Parliament has called on the EU's member states to recognize Guaido as interim president. The socialist government of Spain, which has strong historic, cultural and economic ties to Venezuela, has said it will do so on Monday if Maduro doesn't call a general election by Sunday. 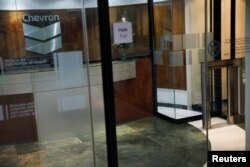 FILE - The logo of Chevron is seen in their office in Caracas, Venezuela, April 18, 2018. Meanwhile, California-based Chevron Corp. said its operations in Venezuela will continue normally for the "foreseeable future'' despite newly imposed U.S. sanctions on Venezuelan state-owned oil company Petroleos de Venezuela SA. "For the foreseeable future, we feel like we can maintain a good stable operation and a safe operation on the ground in Venezuela,'' Chevron CEO Michael Wirth said Friday in a conference call with Wall Street analysts. Chevron's refining operations in the U.S. are well-prepared to handle an expected disruption of Venezuelan crude supply because of the sanctions, Wirth said, adding that Chevron had a contingency plan in anticipation of the sanctions and has alternate sourcing.